A Philippine soldier stands guard next to fishing boats at a pier in Masinloc town, Zambales province on May 18. 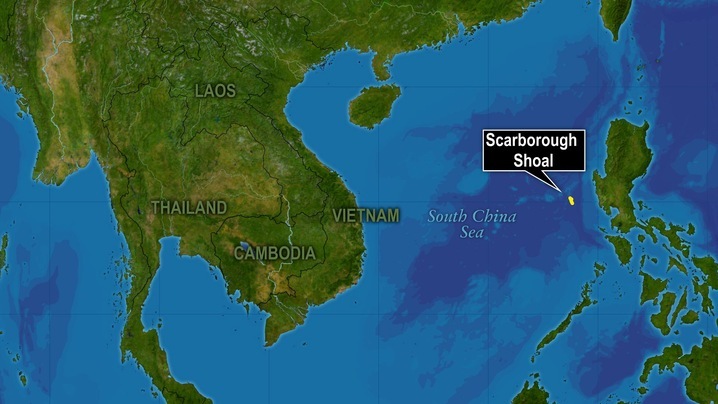 Protesters planned to use the boats to get to the disputed Scarborough Shoal. Photo by Ted Aljibe/AFP/GettyImages. Secretary of State Hillary Clinton’s visit to China this week marked the end of what has been a bruising summer in the Asia Pacific. Disputes between China and its neighbors have flared enough to raise the temperature in some of the world’s most vital shipping lanes. At the heart of many of these conflicts are dense fishing grounds and potentially massive energy reserves. Vietnam, the Philippines and China are all scrambling to advance offshore drilling efforts in contested regions, and overexploited coastal zones have driven fishermen to venture further and further into disputed waters. Diplomacy has stalled, China continues to refuse multilateral talks, while smaller countries with claims in the region are fortifying defenses and soliciting help from foreign powers. It’s quickly shaping into the greatest geopolitical chess match to strike the high seas in decades. In the balance are vast consequences for global trade, American influence abroad and the livelihoods of 10s of millions of people who depend daily on ocean resources. The United States, meanwhile, has great interest in the Asia Pacific for its shipping lanes and strategic military positioning. American diplomats have had to walk a tight-rope between concerns from regional allies, such as Japan and the Philippines, while appeasing China, its second leading trade partner. On a map, the five major flashpoints for this festering conflict are just specks in a seemingly endless expanse of blue. But for the handful of nations, including the United States, now locked in bitter dispute over them, they are the keys to a prolonged and energy independent tomorrow. 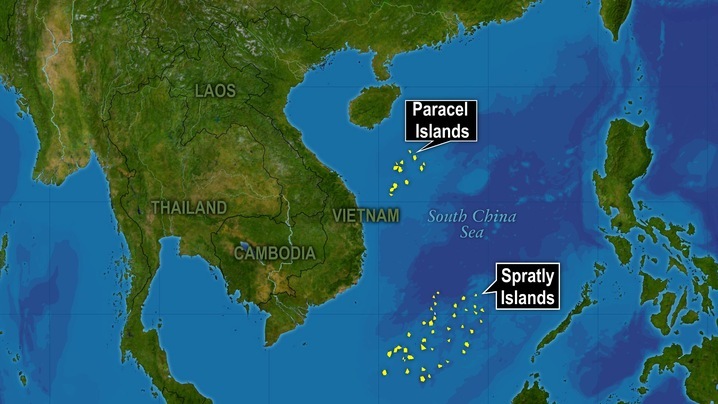 In July, in one of its boldest moves yet in contested waters, China established a city and military garrison on a sparsely populated island in the Paracels to manage the nearly 1.4 million-mile swath of ocean it now claims in the South China Sea. The move was a direct response to an earlier attempt by Vietnam to force foreign ships to notify officials before crossing their waters. It also put neighbors and the United States on notice that China has no plans of backing away from rival claims. They will simply fight fire with fire. 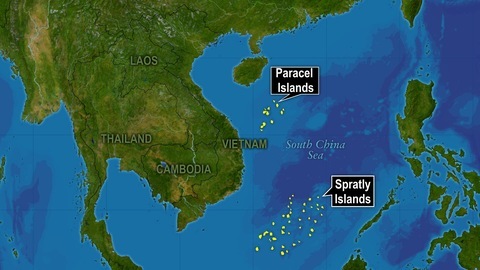 In addition to the island, China claims the entirety of the Paracel and Spratly chains — the largest underdeveloped archipelagos in the South China Sea — and their surrounding waters, which are dense with fish and cover potentially vast oil and natural gas reserves. The claim is hotly refuted by Vietnam and the Philippines, which each claim portions of both chains. China and the Philippines have long bickered over this tiny guano-coated outcropping and the fishing grounds and purportedly vast energy stores it pinpoints. But lately the feud has taken a hostile turn and each side appears to be growing bolder in its claim, building defenses and digging in for what could prove a violent next couple of years. Last spring, a clash erupted between the two countries when a Philippine warship tried to force Chinese fishermen from the shoal, prompting China to dispatch paramilitary ships and put a freeze on Filipino banana imports. A tense two-month staredown ensued. The Philippines finally backed off, at least temporarily; the Chinese still have boats there and are reportedly blocking Filipino fishermen from reaching the best fishing grounds. At its annual meeting this summer, ASEAN, the bloc representing Southeast Asian interests, failed to publicly address the Scarborough conflict and others like it. For the first time in its 45-year history, the group failed even to produce a simple communiquÃ©, and reports trickled out that Cambodia, which China continues to pump with money, opposed any mention of the disputes. Filipino President Benigno Aquino III announced in July that his country will acquire at least 40 military aircraft, a retired U.S. Coast Guard boat and other weapons in the next two years, in order to better defend itself in future confrontations. Anti-Japanese protests have spread across China in recent weeks after Japan arrested Chinese activists who sailed to these disputed islands in the East China Sea and began hurling bricks at Japanese coast guard officials. 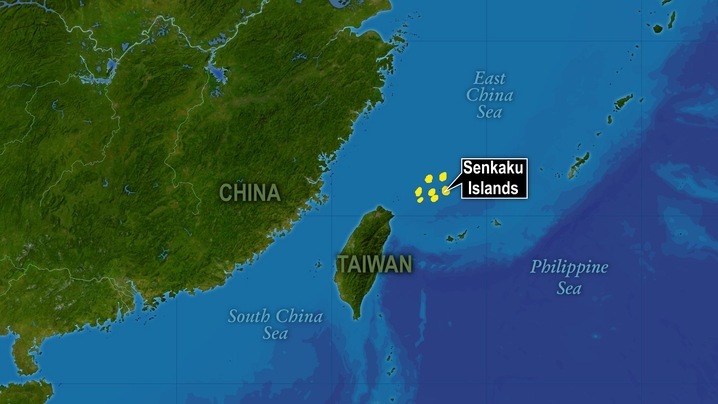 Japan has claimed the group of islands for more than 40 years, despite opposition from both China and Taiwan. Both sides have interests in the archipelago’s strategic positioning and its nearby resources — fish, mineral deposits and potential energy reserves. The feud intensified in 2010, when a Chinese fishing vessel collided with Japanese patrol ships near one of the islands. Japan arrested and deported the fishermen, but the episode infuriated many in China and Taiwan. Japan sparked a fresh round of shouting when it announced last year it would purchase the islands from their longtime private Japanese owner. South Korean President Lee Myung-bak ripped open the long-festering wound between Japan and his country over these islands when he visited them last month — the first such visit by a South Korean president ever. The Japanese government immediately denounced the trip and lashed back by pulling its ambassador out of Seoul. 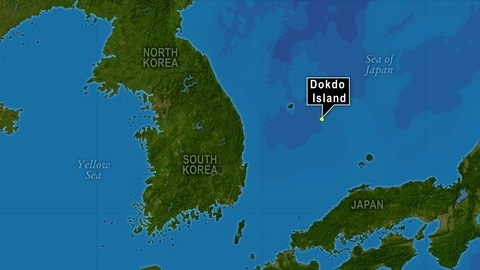 Japan and both Koreas lay claim to this pair of islands and their surrounding fishing grounds, though the central disagreement has long been between Japan and South Korea. South Korea, which has stationed a military unit on the islands since the 1950s, views them as important symbols in its still-lingering colonial vendetta with Japan.